How to add video transitions between scenes? If you have a set of videos or photos on the same theme and want to combine them into a single movie or slideshow, you might want to apply the Transition effect so that one scene smoothly goes into another. apply random transitions to quickly get an impressive result without efforts. Please read the How to start working with AVS Video Editor? guide to learn how to download and install the application and import your videos and photos into the program. Note: it's not recommended to apply transitions between too short videos. If you process a set of photos, you can first increase the length of time that each photo is displayed on the screen (by default it is set to 5 seconds). To specify the same duration for all the images, it's better to perform this operation before adding photos to the Timeline/Storyboard area. In the Top Menu, follow: Edit -> Settings.... In a new window that opens, switch to the Edit tab and set the necessary value in the Image/color box of the Default durations section. You can also change the default transition duration in the Transition field of this window. Switch to the Storyboard view as it allows to add transitions more easily and edit them more precisely. Click the button above the Timeline to do that. In the Storyboard view, press the Transitions central button to display all the available transitions in the Files and Effects area. They are also sorted by categories on the left side of the program window. To easily find a suitable transition, switch between these categories. To add a certain transition, first select the place between two videos or images on the Storyboard where you want a transition to be added, then right-click the necessary transition in the Files and Effects area and select the Add or Replace Transition option in the right-click menu. Repeat the operation to add different transitions between all other scenes. To use one and the same transition between all your videos and photos, right-click the transition you want to add and use the Apply Transition to All option from the express menu. 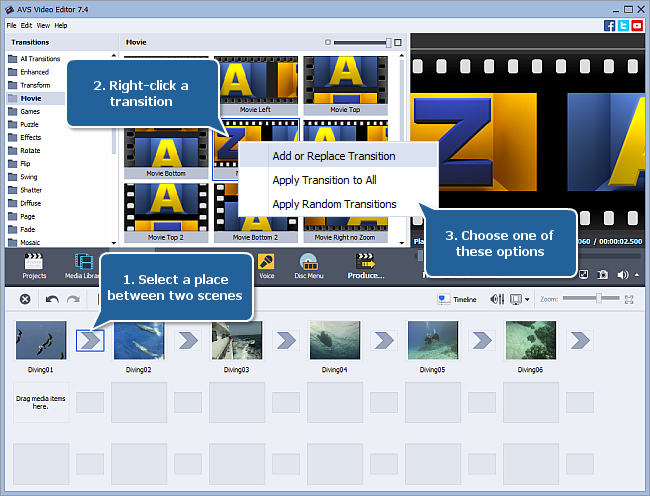 To add random transitions between all the video clips, right-click any transition and choose the Apply Random Transitions option from the menu. The transitions can also be added by simple drag-and-dropping them to the Storyboard Area. To do that, select the transition you would like to add to the video, and click it with the left mouse button. 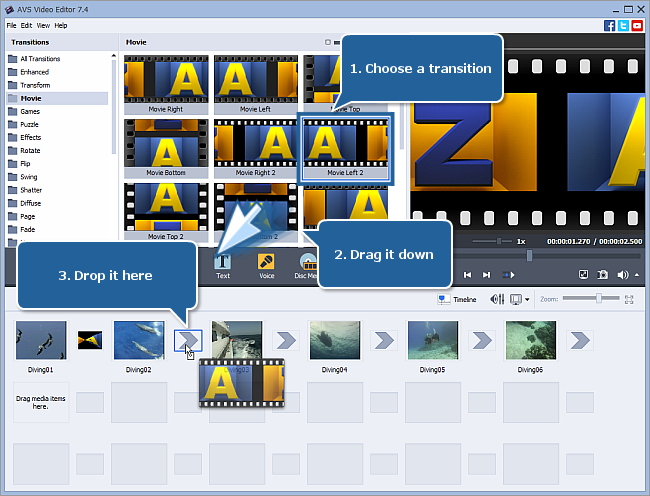 Then, without releasing the button, drag the selected transition to the place between two video clips and drop it there. After all the transition are added to the Storyboard, you can change their duration between the scenes. The default transition duration is two seconds. Select the necessary transition on the Storyboard, then click the Transition button on the Storyboard Toolbar above. 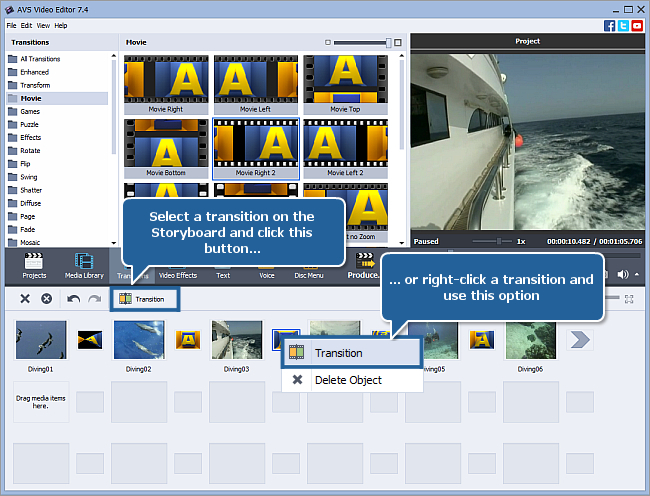 You can also right-click a transition on the Storyboard and choose the Transition option from the right-click menu. The Transition window will open. 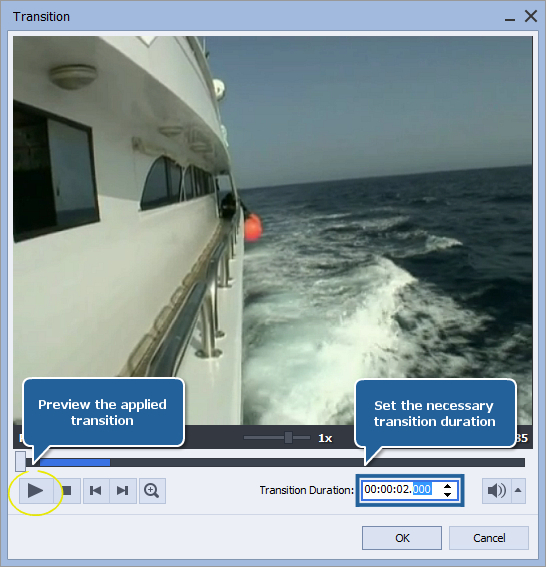 To alter the length of the transition between two clips, use the Transition Duration field. You can manually enter the necessary value measured in seconds or use the up and down arrows. In this window, you can also playback the video clicking the button and see how the added transition is applied. If you are satisfied with the result, click OK to apply the changes or Cancel to discard them and close the Transition properties window. 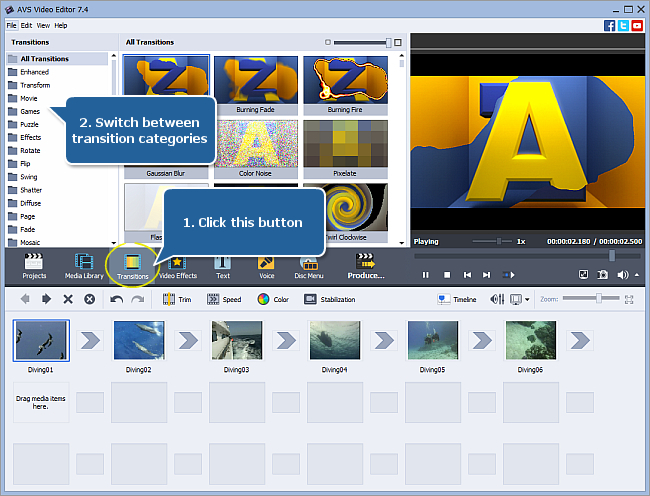 When all the transitions are adjusted, you can preview your entire resulting movie with added transitions and save it in a desired format. Please refer to the How to save the project and video in AVS Video Editor? guide to learn more on how to save your video.